In mid-2013, three seemingly unimportant things happened. My cousin gave me a huge bag full of unused wool from her deceased mother’s estate. I glared at it regularly for a couple of weeks, wondering what I could do with it all. Meanwhile, a friend told me she looked at my blog nearly every day to see what I was up to. I thought she must have been dreadfully disappointed as my blogging habits were far from regular. Then the catalyst came. My husband shared a link about the European Union being sued by the Bayer company to overturn their decision banning the sale of their pesticides for a mere two years, because it is suspected the pesticides are killing bees in the millions. I was outraged, but what could I do about it? I’m just one person and I live in Australia, a long way from the issue. While my anger about the bees was still strong, everything fell into place, and in October 2013 I devised and began my long journey of “1000 Flowers for the Planet”. Using the wool I’d been given, I blog a photo of a crocheted flower, one per day for 1000 days and each with a different suggestion for how we can improve the planet. With my intention being to incite people to positive action, every suggestion is presented in a positive way, without using words such as ‘don’t’ or ‘stop’. When people are told what they can do they are more likely to respond than when being told what they can’t do. The flowers cover environmental, social, moral and ethical issues that we all could benefit from thinking about. On 4 October 2013, World Animal Day, I blogged my first Flower “Care for Bees”, highlighting the threat to these extremely important insects. Since then I have researched nearly 400 issues, including the plight of animals everywhere, due to factory farming, animal testing, chemical poisoning, habitat clearance, maltreatment, overfishing and many other human activities that are distressing, to say the least. The art project has three parts, with the first being social media, including my blog at www.margaretarowe.blogspot.com and tumblr at http://1000flowersfortheplanet.tumblr.com/, which feeds into my Facebook account. 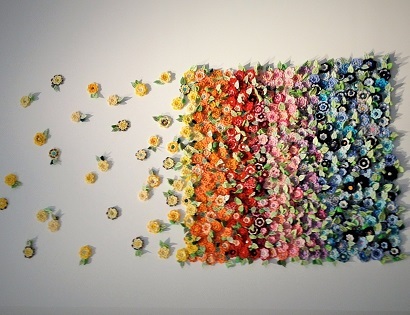 Eventually the 1000 Flowers will become an art installation, already seen in part when 400 Flowers were put together as a work in progress at Manningham Gallery, Melbourne, Australia in early 2014. Their impact was rewarding. The third part of the project is my individual textile art pieces that are available for sale as the income side of my arts practice. When I began my career as an emerging artist, I knew I wanted to make statements through my work, and I choose to use mostly repurposed, recycled and pre-loved materials, along with found objects. Bodies of work develop from what people give me, or what I find in charity shops, to ensure I live by the words that I write in many of my Flowers. “1000 Flowers for the Planet” is my way of presenting suggestions that show ways everyone can help improve this wonderful planet on which we live. This is our home. We’ve been responsible for messing it up – let’s be responsible for tidying up and working towards a better future. There is enough to go around, everyone can live comfortably, but we have to stop fighting each other and destroying all the beautiful creatures that share this world with us, and make it better. If everyone took up just 1% of my 1000 suggestions (only ten changes) imagine the huge shift in the wellbeing of the planet.